Located in the very heart of Troyes, this vacation rental for 2 people with private Spa provides all mod cons for enjoying your stay worry-free. Do you wish to rest ? To book a romantic week-end ? To discover the tourist attractions of Troyes and the department of Aube ? Have a City break ! Urban Spa will make you spend your best nights in Troyes. Book a one or several nights stay in Troyes in the Urban Spa apartment with private Spa. Please contact us for any specific need or demand. Located in Champagne, in the department of Aube just 1h30 from Paris, the city of Troyes will seduce you with its rich cultural and natural heritage as well as its sports and leisure activities. Discover around 8000 hectares of vineyard in the surroundings of Troyes and visit about 30 villages that border the Côte des Bars. Linger especially in the surprising village of Les Riceys with its 3 PDO : champagne, coteau champenois and rosé des Riceys. Thanks to its 866 hectares vineyard, this village is the world biggest owner of Champagne PDO area. With its 11 churches and its 4 museums whose collections cover a huge period from prehistory to Modern art, Troyes will be able to charm all historical, cultural and industrial heritage lovers. The factory outlets were born in Troyes in the 1960s. Ever since then, the city has been known as the European biggest outlet and fashion center. You can find hundreds of brands in the 230 stores and shops that receive about 5 million visitors every year. Formal, botanical, landscaped and priory gardens : the department of Aube and Troyes surroundings provide a lot of parks and gardens you can visit. You can especially discover the Regional Nature Reserve of the Orient Forest which covers about 70 000 hectares and its diversified local fauna and flora spread around the Orient Forest Lakes (which are the artificial reservoir-lake of the Seine meant to avoid Paris being flooded). Many sports, touristic and leisure activities can be practiced there. 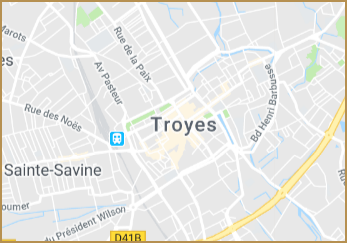 Elected as the French sportiest city in 1981 and 2005 by the Equipe magazine, Troyes gathers about 400 sports and leisure clubs and societies specialized in many different disciplines. For example, the professional football club ESTAC is performing this year 2017-2018 in the League 1 Conforama championship. All year long, a lot of sporting events take place in Troyes (you can see the schedule on the next page). 2 minutes far from the apartment by walk, the theaters of Champagne and of the Madeleine will offer you many spectacles, plays and concerts. You can also enjoy the amusement park Nigloland located just 30 minutes far from Troyes and its about 40 attractions for the whole family.